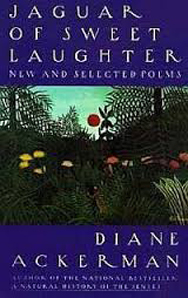 In A Natural History of the Senses Diane Ackerman revealed herself as a naturalist who writes with the sensuous immediately of a great poet. Now Jaguar of Sweet Laughter presents the work of a poet with the precise and wondering eye of a gifted naturalist. Ackerman's Olympian vision records and transforms landscapes from Amazonia to Antarctica, while her imaginative empathy penetrates the otherness of hummingbirds, deer, and trilobites. But even as they draw readers into the wild heart of nature, Ackerman's poems are indelible reminders of what it is to be a human being — the "jaguar of sweet laughter" that, according to Mayan mythology, astonished the world because it was the first animal to speak.